As 3D printing becomes more commonplace and accessible, its reach has stretched into a variety of different industries. Scientists and medical professionals are currently working on how to use bioprinters to print organs. The machines are able to print tissue in order to make organs. There are some who suggest that 3D-printed organs will begin to be used for transplants and other purposes, such as research, within five years from now. While the new technology has the potential to eliminate the shortage of organs available for those in need of transplants, it remains to be seen just how soon the printed organs will be widely available for those in need. Much like 3D printing, the use of artificial intelligence (AI) is becoming more widely employed by many industries, including the pharmaceutical industry. AI does not mean robots becoming smarter than humans and things going awry from there. Rather, AI in this context simply refers to using computers and machine intelligence to take care of simple tasks in order to save time for the tasks that require human energy and brain power. Similar technology used for facial recognition, for example, is being researched for use in the medical and pharmaceutical industries. Scientists working in the research and development aspects of the pharma industry are also looking to use AI to discover new ways in which elements and compounds can be effective in engineering new groundbreaking drugs. The Obalon Balloon System and other intragastric balloons are devices designed to help patients lose weight. The saline-filled balloons are either implanted (usually by an endoscope) or swallowed. The product works by taking up room in a patient’s stomach so they will eat less food and therefore lose weight. The balloons work best in conjunction with regular exercise. The Obalon Balloon System uses three balloons that are placed individually over a period of three months. At the end of a six-month period, the balloons are removed by way of endoscopy. This technological innovation can be an effective tool for individuals who have struggled to make lifestyle changes involving diet and exercise alone. Intragastric balloons must be prescribed by physicians. Biochemical product development, in layman’s terms, is how a pharmaceutical drug is created. Those who specialize in pharmaceutical biochemistry are the ones who create new pharmaceuticals that help people who are dealing with a health issue. They also conduct studies on how drugs interact with the health and wellness of human beings. As with other technological advancements, there are great strides being made in biochemical product development as well. In some cases, they are using the artificial intelligence we mentioned earlier to help them make breakthroughs. It will be interesting to see what the future holds as scientists and biomedical engineers work to produce drugs that can boost the health of the human population. So how do all of these technological advances in pharmaceutical products tie back to the duties of a pharmacist? Easy. 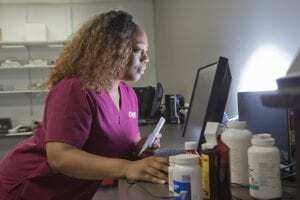 Pharmacists will be on the front lines of dispersing these new kinds of medicines, as they are the ones with whom consumers typically interact when they pick up prescriptions. They’ll have to stay current with new innovations in order to best answer any questions patients have at the time of pickup. Pharmacists aren’t the only ones who will have to adapt to any changes in the near future; pharmacy technicians will have to adjust as well. The duties of pharmacy technicians include organizing the pharmacy’s inventory, packing and labeling the drugs, customer service tasks, such as answering phones and checking people out, and more. Pharmacists and the pharmacy technicians they supervise are essential links between the public and the pharmaceutical industry. Are you interested in the pharmaceutical industry? Would helping pharmacists be a rewarding job for you? If so, consider enrolling in a pharmacy technician program. If you live in Chicagoland, consider Coyne College. Coyne College’s Pharmacy Technician program is one of Chicago’s finest, catered to students like you who are interested in the profession. In Coyne’s comprehensive program, you will learn the finer points of working as a pharmacy technician and how to adapt to the ever-changing landscape of the American healthcare system. You can finish Coyne’s program in as little as 42 weeks. In less than one year’s time, you can be ready to start your new career as a certified pharmacy technician. Coyne College’s Pharmacy Technician program has day classes available at the Coyne’s Chicago Loop campus at the intersection of State and Madison Streets. Coyne College offers an array of career services and job placement help for its students, including mock interviews, externships, resume assistance, and a vast alumni network that can help you land entry-level employment after completing the program. Now is a great time to get into the pharmaceuticals industry and be part of bettering the health of the world’s population. Write yourself a prescription for a career as a pharmacy technician and get started today by visiting https://www.coynecollege.edu/.